You can view a list of all the participants in the Onyx database: past and future participants, as well as those whose interviews are scheduled for the current date—today. The list does not include participants that have been purged from the Onyx database. See Data Purge. If the Participants page is not displayed, click the Participants tab. Click the All Participants button. The Participants page is updated to show all participants in the Onyx database. You can view a list of all the participants whose interviews are scheduled for the current date—today. 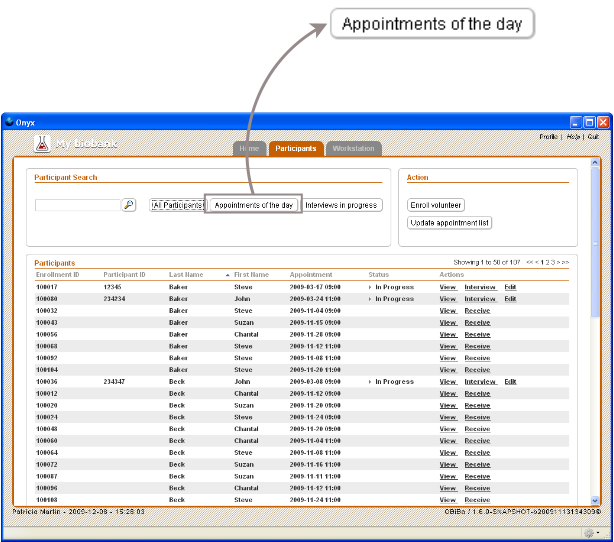 Click the Appointments of the day button. The Participants list is updated to show all participants who have interviews today. You can view a list of all the participants whose interviews have the status In Progress. This status does not necessarily mean that the participant is seated with a staff member and that data is being collected from the participant. In Progress simply means that the particicipant’s interview was started and that it is not finished yet. 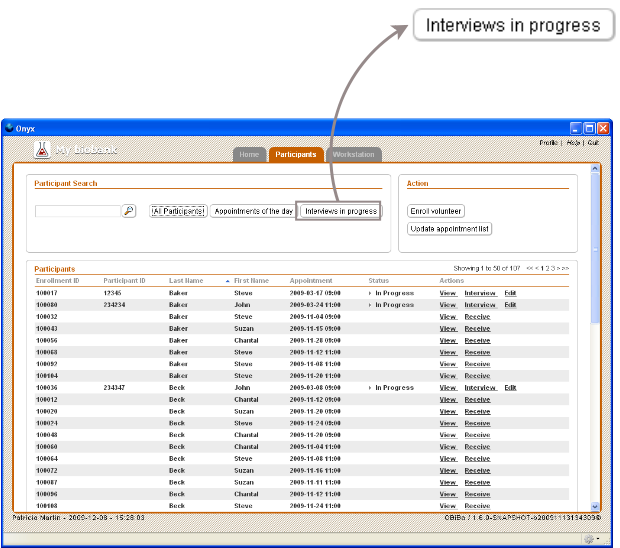 If the Participants page is not displayed, click the Participants tab.# Click the Interviews in progress button. cThe Participants list is updated to show all participants whose interviews have the status In Progress. If you see a icon at the end of the row for the participant, this indicates that an Onyx user has a lock on the interview. See Determining who has a lock on a participant. Onyx gives you several ways to find participants. this table summarizes the techniques you can use to search for participants. Scan participant’s barcode (or enter participant ID manually) in the Home page and click Go to interview The participant’s Interview page opens. Enter participant ID or enrollment ID in search field on Participants page and click The Participants list will be updated and will include only one participant—the one with the ID that you entered. Enter all or part of participant’s name in search field in the Participants page and click The Participants list is updated—it contains one or more participants, depending on what you entered and the names of the participants in the database. If you click on First Name, the list will be displayed in alphabetical order by participants’ first names. 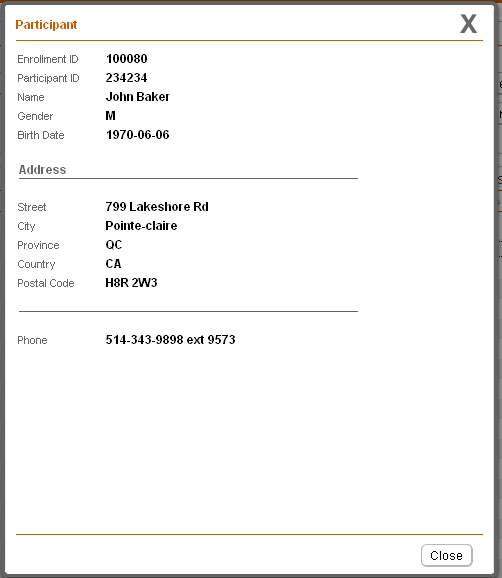 If you click on Enrollment ID, the list will be displayed in numerical order of enrollment IDs. The appointment list may not be up-to-date. The person does not actually have an interview. In either case, contact your participant manager who can update the appointment list or enroll a volunteer if your study accepts them. After a participant has been added to the Onyx database (either through an update of the appointment list or when they were enrolled as a volunteer), you can view their registration information. 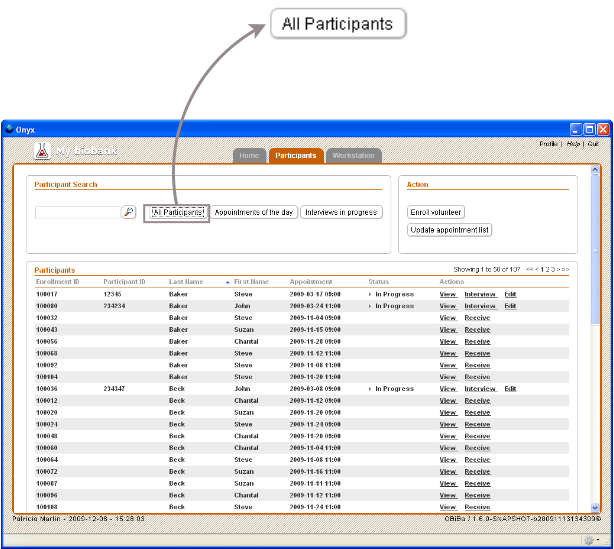 Find the participant whose information you want to view. If you need help finding the participant, see Finding a Participant. 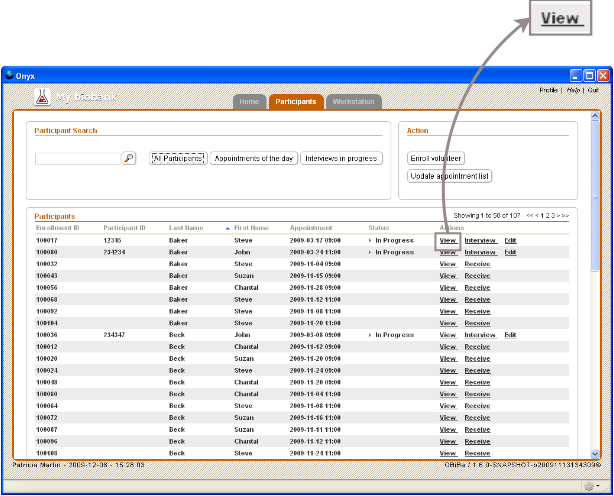 | When the Participants list is displayed, a View link appears (in the Actions column) for the participant. To view a participant’s registration information, click their View link. Select the View link for the participant. The Participant dialog is displayed. | Each study defines the information that is stored for its participants. You may not see the same fields as those shown in this figure. When you have finished viewing the information, select the Close button. The Participant dialog closes. Move the mouse until the arrow cursor is on the lock icon and do not move the mouse for a few seconds. | A small popup message will show the name of the person who has the lock on the interview. See this figure. To see who has a lock on an interview, position the mouse cursor on the lock icon and do not move the mouse. If necessary, your participant manager can unlock the interview. See Unlocking an interview.